This competition has now closed, and the winner has been informed. Thank you to everyone who entered. If you would like to be informed of future competitions, you can sign-up to the MovieGlu newsletter. MovieGlu is giving away a poster signed by Stef Dawson, who plays Annie Cresta in the latest movie. 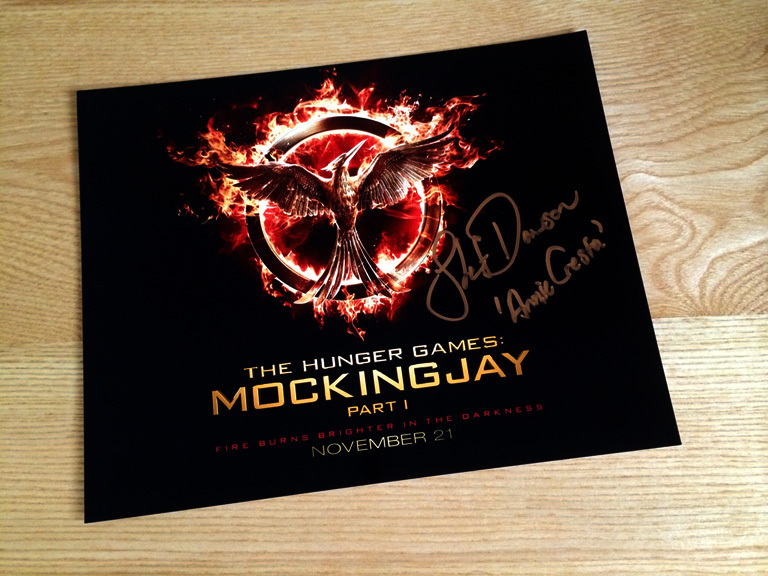 Annie Cresta is the love-interest of Finnick Odair in the movie, and has signed this poster which could be yours. To win this poster, all you need to do is sign up to the MovieGlu newsletter by clicking the button below. The winner will be drawn randomly on 28th February 2015, and the winner notified by email. You must accept the confirmation email you receive to ensure entry into the competition. If you do not receive the confirmation email, please check your Spam or Junk mail folder in case it got lost. Today I’m going to reveal what MovieGlu is all about. I hinted in my earlier blog posts that searching for movie showtimes should be easier, and here at MovieGlu, we think that we have found a forumla to achieve this. Let’s begin though with a look back at where this all started. The first modern movie theaters began life in the early 1900s1, and grew rapidly over the following decades. Firstly they showed very short films of just a few minutes, getting longer as time passed2. However typical movie releases are usually around 90-100 minutes long. But wait, why is length even relevant? You know when a movie starts, and you know its duration. Yes, it’s very easy to work out when it finishes, but it does need a little bit of mental arithmetic. This becomes more important still when you’re planning an evening out, and want to make sure you get the last bus or train home in the evening. Every major movie theater provides the start time of course, and it wasn’t long before timetables of movie showtimes started to become popular. Individual movie theaters published their own adverts on flyers, and in newspapers and magazines. 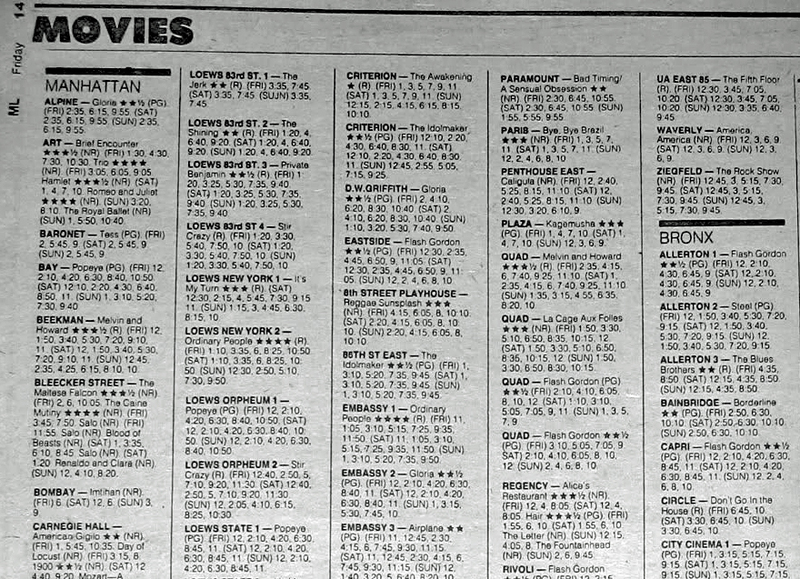 Here’s an example from 1983, from a chain called General Cinema Theatres. The same approach was used in publications all over the world as movies became more popular, and more movie theaters were built. Then came the internet. 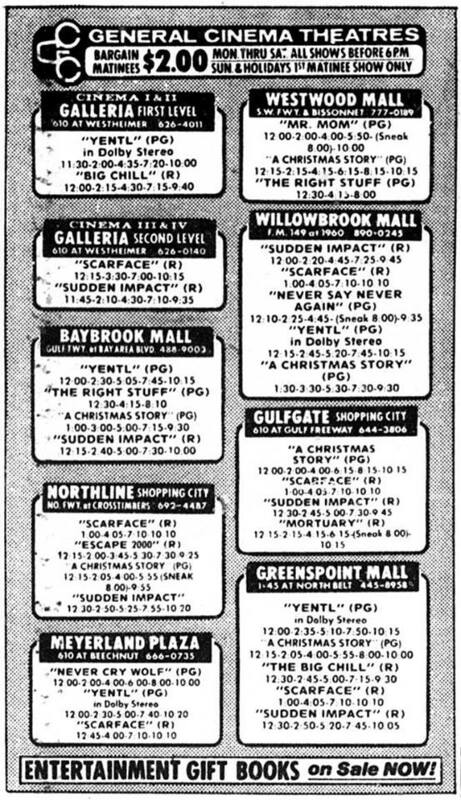 From the 1990s, information about movie showtimes started to appear online. Today there are a countless websites which provide showtime information. Fandango, Movietickets.com, Moviefone, Flixster, IMDB, and even Google are now all major players in the industry. So, what’s the big problem? Websites are covered with too many adverts, which are not only distracting, but are generating decreasing financial returns. Users need a faster, simpler and more intuitive way to make their decisions. Therefore ‘ease of use’ is our number one concern. Fast isn’t just about how quickly our servers return your search results, it’s also about how intuitive our service is, and how long it takes you to achieve your goal. (Now you know why I was talking about duration at the beginning of this post). Some will be quick to implement, others will take a bit longer – but if MovieGlu is going to be a success, it will be because of you. I won’t promise that this particular part of the plan will last forever (especially if we run short of money), but even if we do, I will promise that it won’t be to the detriment of your overall experience. 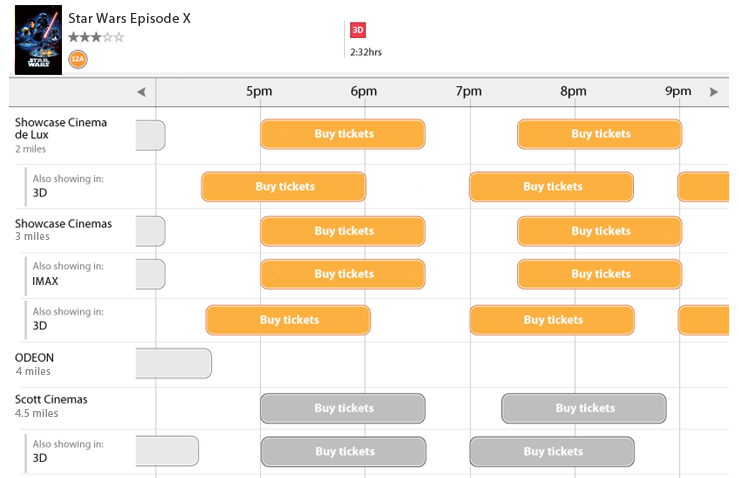 In the next few weeks, you will be able to decide yourself whether we’ve achieved our goal of making movie showtimes easier to search. We’re currently putting the final touches on our website, and pretty soon you’ll be able to try it for yourself. By signing up to take part in our “beta program”, you may be able to make a difference to what we hope will be the future of movie showtime search. I was particularly pleased to see the news today that Google has promised to make “significant” changes to how rivals appear in search results. As the founder of MovieGlu, a small business about to launch as a rival to Google in the movie listings field, this is indeed good news to me personally. They have agreed to this change in order to avoid a mutli-billion Euro fine from the European Union’s Competition Commisioner. It will be interesting to see whether such changes extend to Google’s service in the United States and beyond, or just limited to Europe. Google has been showing movie listings for a few years. 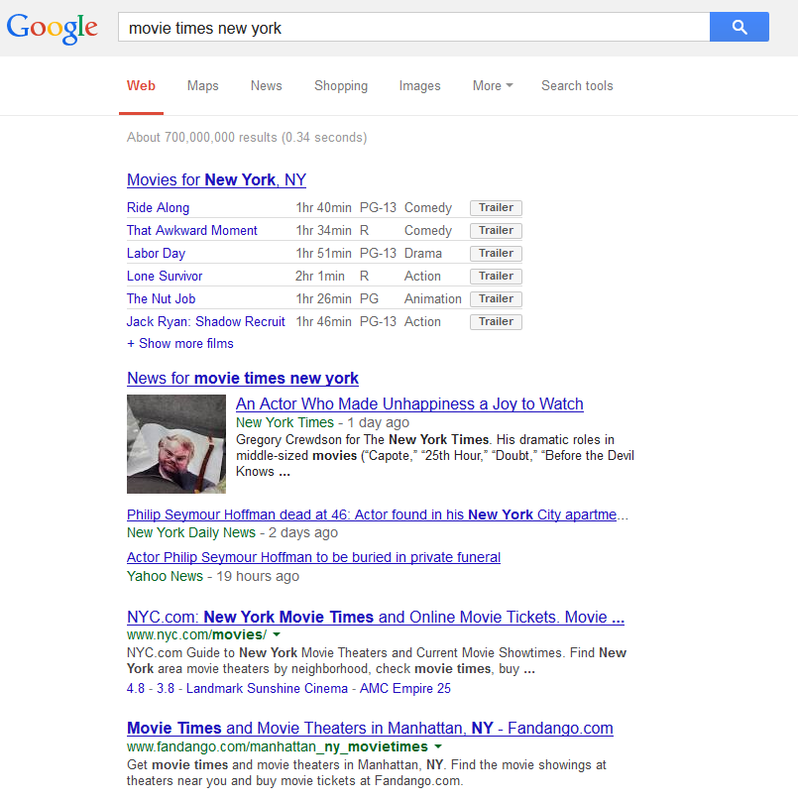 Take for example this search: “movie times new york”. The first result is Google’s own listings for movies showing in New York City. Note that the first results are their own movie theater listings, followed by Google’s own news feed results. Only then are their competitors listed – in this case nyc.com and fandango.com – results that I believe match the user’s search intent. When such a search result is displayed, it would be hard not to click on the first links displayed, and follow through. Yes, I will admit that it is incredibly useful to end users, but Google’s approach will be hitting its competitors hard. It seems that Google’s own results triumph over any effort businesses put into their own Search Engine Optimisation (SEO). And movie listings aren’t the only area where Google prioritises it’s own content – they also do the same thing with Music (via links to YouTube), Restaurants and Shopping. So any changes they can implement to give equal relevance and visibility to smaller competitors is a very welcome change. UPDATE 06-Feb-14: On further investigation, I discovered this statement from the US Federal Trade Commission which you can find here. In short, the Commission found that “the introduction of Universal Search, as well as additional changes made to Google’s search algorithms – even those that may have had the effect of harming individual competitors – could be plausibly justified as innovations that improved Google’s product and the experience of its users. It therefore has chosen to close the investigation.”. In other words, they believe there is nothing wrong in Google promoting their own content over others in this area. UPDATE 03-July-14: The BBC broadcast an interview on this subject of Google “downgrading” its competitors products. Visit MovieGlu – Searching for movie showtimes made easy.